Any mechanic will tell you the best tools in the world are useless if you don’t understand how to apply them to the vehicle you’re working on. The same holds true when it comes to techniques and skills for fighting and self-defense. While it’s valuable to know how to punch, kick, block, or pull off an arm-bar… these techniques are only useful when applied at the right time, in the right situation, against the most vulnerable target on your hypothetical opponent. By the same token, if you’re attacked, knowing what part of your body to defend with against different kinds of attacks (knife, blunt weapon, fist, foot, brick) can mean the difference between life and death. When I talk to people who haven’t studied the “martial” side of martial arts in great detail, it becomes clear that there is a serious lack of understanding of the strengths and weaknesses of their own bodies, much less those of an opponent. When it comes to defending your life from an attacker, a solid understanding of your physiology, with all its strengths and weaknesses, is foundational. With different kinds of attacks, there are different vulnerabilities, and different areas of your body that you need to protect. Of the entire body, your eyes and throat are the most vulnerable. While the eyes are very small targets, even a tiny amount of force can be both physically and psychologically debilitating. Your throat is especially vulnerable because, relative to the eyes, it is a much larger target, and is vulnerable for both the veins and arteries, the esophageal airway, and the delicate neck skeletal structure and atlas (or top vertebra which connects the neck to the skull). While the upper back is fairly well armored, your kidneys are found on both sides of your lower back and are somewhat vulnerable to attack. The solar plexus is located at the bottom of your rib cage, right in the center of your torso. Being struck here, particularly upward, can lead to having the wind knocked out of you… a temporary problem but even a second of this kind of vulnerability can get you killed (I go into having the wind knocked out of you, and how to avoid it, in great detail here). While it can be hard to keep this area covered while also protecting your head, face, neck and short ribs, keeping your stomach tensed and flexed whenever an attacker is within range to strike will significantly reduce the chance of getting the wind knocked out of you. 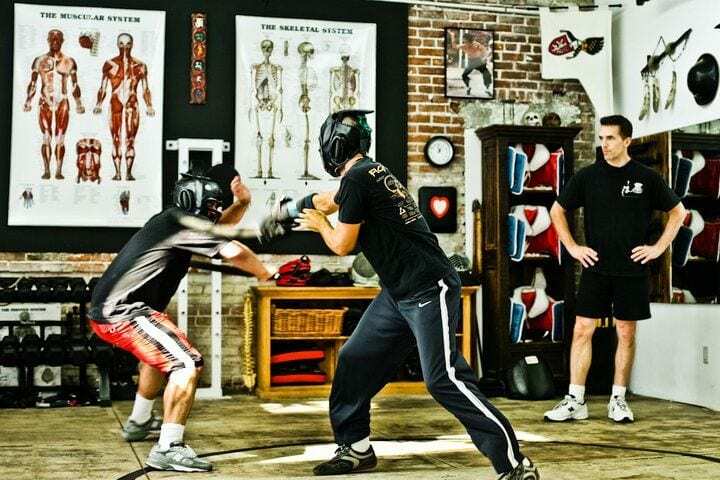 By keeping your elbows tucked similar to a boxer, you can protect your floating ribs when someone is in close enough to hit you with a ‘body shot’. Similarly, for a man, being struck in the groin can be debilitating (as well as psychologically damaging). To avoid this, try to not adopt a ‘goal post’ stance, with your legs wide open. Keep your front leg turned slightly inward, as this keeps your knee turned slightly in, which in turn closes the ‘door’ to your groin. Your throat is especially vulnerable to attack, which is why it’s important to keep your chin down and your shoulders raised slightly. It is preferable to take damage to your arms and shoulders than to pretty much any part of your neck or throat. Another important aspect to protecting yourself is to NEVER turn your back on an attacker… unless you’re well out of range and are running away (always the best bet). The reason is simple: when your back is turned, your arms, legs, hands and feet are all useless… they can’t protect you and they also can’t attack your attacker. When your attacker is directly in front of you, they are in what we call your “100% Zone”. We call it that because in this relationship, you are able to strike them with both arms and legs… with 100% of your weapons. When they are to your side, you can only defend or attack them with one arm or leg… half your weapons. Thus they are in your “50% Zone”. When they are behind you, they are in your “0% Zone” because neither arms nor legs can do much to help from this position. You are now in a 100% defensive position… Leaving them in a 100% offensive position. They are now free to attack you with everything they’ve got, with no fear of being hit or counter-attacked. This is the worst of all positions to be in, and can quickly lead to your demise. Conversely, if you are able to keep them in your 100% position, while moving yourself to THEIR 50% or 0% position, you increase your odds significantly. 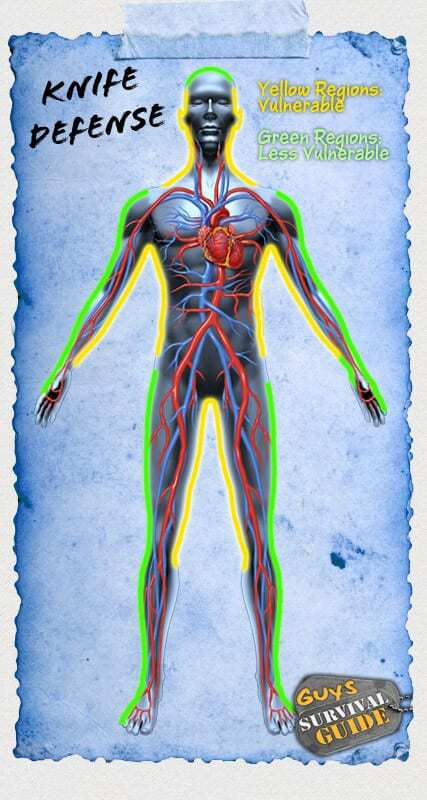 Bladed attacks are most damaging to two areas: zones with veins and arteries, and areas with internal organs. It is much preferable to take a knife to your musculature, which will not bleed out nearly as fast or kill you. When defending against a knife, you want to focus on using the tops of your forearms… this is for two reasons: 1) the veins and arteries of the arm are all on the bottom “belly” of your forearms, so you are much less likely to ‘bleed out’ from a cut where there are no such targets 2) if cut on the top of your forearm, it will affect the muscles that you use to OPEN your hands. If cut on the bottom belly of your forearms, it disables the muscles which control CLOSING your hands. This means losing your ability to grasp your opponent, their weapon hand, or even your own weapon. Thus, taking a cut on the top of the forearm is superior to almost any other location on your body. It is also very far from your heart, and unlikely to lead to a fatality. As gruesome as it is to think about it, your bones are also enemies of the knife. The knife is a relatively delicate weapon and works by slicing through skin, muscle, veins and organs. Bone stops a knife from being able to penetrate. The Ulna is a very shallow bone with almost nothing but skin protecting it… thus it serves as an excellent ‘shield’ against a knife attack. Wrapping a shirt around your forearm and positioning your hands somewhat facing your face will expose the ulna and afford you extra protection. If you can’t run away from an attacker with a knife, you want to keep as much distance as possible. A knife is devastating at close range. Diving in to try and grab the knife is a quick way to get gutted like a fish. Also, it’s important to remember that you have options OTHER than trying to grab their weapon hand. If you knock them unconscious, or can grab another object that you can use as an improvised weapon – preferably with more striking range than a knife – you stand a much better chance. Impact Weapon Defense: Attacked By Baseball Bat, Stick, Wrench, Hammer, etc. On the other hand, bludgeoning weapons work on the principle of crushing and smashing. They are much less effective on the soft compressible muscles and tissues of the body, which absorb their impact. However, impact weapons are devastating to bones and joints… So if your attacker has a stick, baseball bat, wrench, etc., you need to think differently. Sticking your hands out is just begging to have the delicate, and important bones in your hands crushed to dust… standing in an extended pose with one leg way forward limits your ability to quickly move out of the way of an attack and exposes that forward leg and knee to a devastating and crippling blow. Against an opponent with an impact weapon, it is preferable to keep a neutral position that allows you the most mobility. You want to be able to move quickly in and out of range of their weapon. If you can’t run away, your best chance at neutralizing their ability to tear you apart is by “crashing in”. Just like a kick that takes a relatively large motion to generate its force, an impact weapon needs at least a little range to be most effective. By crashing in, you steal your opponent’s ability to swing their weapon effectively, and lessen the potential of a catastrophic injury. So remember: Bladed Weapon, block with bones and muscled areas, and protect the soft, veiny parts of your body that will suffer the most damage. With Impact Weapons protect your joints and try to crash in before or (ideally) immediately after your attacker has swung the weapon… this will be when it’s hardest to regenerate force for them. This is just a primer on self-defense. I’ve trained for 15 years with Master Instructor Mark Mikita of Fightology.com and highly recommend learning to defend yourself. It’s better to have the skill and never need it, than one day need it and not have it. just learning my first martial art krav maga , literally only a few weeks in but really enjoying it , very basic but great . really like this idea !! yes excellent post , all the information im looking for , thanks . The insight regarding the range of the attacker’s weapon is important. When defending against a knife, I find it useful to close off rather than open up the attacker. This keeps the blade away from your centerline. A jacket or sweater as an improv shield is particularly useful, especially if you have trained in sword-and-buckler. You have a decent chance of catching the tip of the blade in a jacket and disarming the attacker.